Keegan Blasby is certainly doing his best to end his junior career on an upbeat note. Blasby, who turned 21 on Mar. 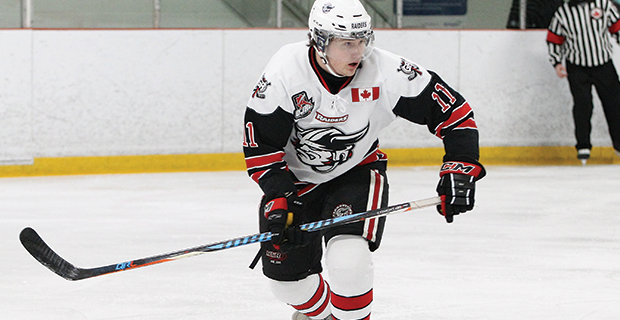 14, is a right winger with the Georgetown Raiders, who are currently battling the Trenton Golden Hawks in the Ontario Junior Hockey League’s championship series. The best-of-seven series, which resumes Tuesday in Georgetown, is currently deadlocked at 1-1. The well-traveled Blasby, who is with his seventh junior team, is leading all OJHL players with 10 playoff goals. He’s also been credited with five assists in 17 postseason contests. Regardless of what transpires in this series, Blasby and his teammates already know they will continue to play some hockey this spring. By advancing to the OJHL finals, the Raiders have guaranteed themselves a spot in the Dudley Hewitt Cup tournament, set for May 2-6. As hosts, the Golden Hawks receive an automatic berth in this tourney, a regional qualifier for the RBC Cup, the national Junior A championship event. Blasby is hoping his squad enters the Dudley Hewitt Cup as OJHL champs. Blasby, who is from Markham, has been forced to change his focus numerous times during his junior career, which started back in the 2012-13 season. As a 16-year-old, he started that campaign with the OJHL’s Hamilton Red Wings, who have since relocated and become the Markham Royals. But after nine games with the Red Wings, he was released and ended up back in the minor hockey ranks, with the Markham Waxers’ Midget AAA club. Though he spent the majority of that season with the Waxers, Blasby also played three games with the Kitchener Rangers, the Ontario Hockey League squad that had drafted him, and one match with the OJHL’s Aurora Tigers. The following season, Blasby split his time between the OHL’s Rangers and the Kitchener Dutchmen, a Junior B side that competes in the Greater Ontario Junior Hockey League. Then, during the 2014-15 season, Blasby got to experience something not too many Canadian junior players have done. He played a season of junior hockey in Germany, with the Starbulls Rosenheim Under-19 team. A Markham neighbour, who knew one of the German coaches, set up that connection. “I jumped at the chance to go,” Blasby said of his season abroad. Blasby then made his way back to the OJHL last year, where he ended up with the North York Rangers. “I had been living away from home for a while and I wanted to finish my junior career here in Canada,” he said. Blasby also began this season in North York before he ended up with Georgetown via a midseason trade. He’s now being guided by Raiders bench boss Greg Walters, who was recently selected as the OJHL’s Coach of the Year. Blasby will take his talents to the university ranks next season. He’s be joining Toronto’s York Lions, who captured the Ontario crown this year.